221 stitches on US 3 needles? I never knew my torso was so interminably long! I’m at 27 cm with another 11 cm to go before the armholes. The pattern is DROPS 88-4 Cardigan knit in Queensland Kathmandu DK Tweed. Knowing that I would quickly lose my knitting mojo on the body, I knit the sleeves first hoping that having “only the body left” would help me finish. 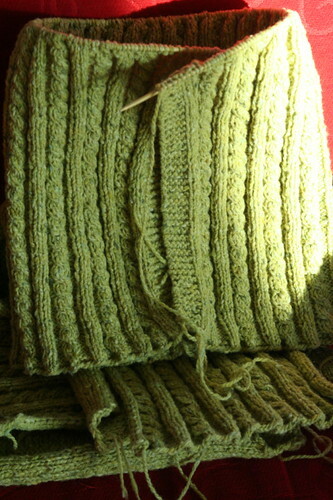 The cabled rib sections are knit on US 3 needles, the stockinette sections on US 6. 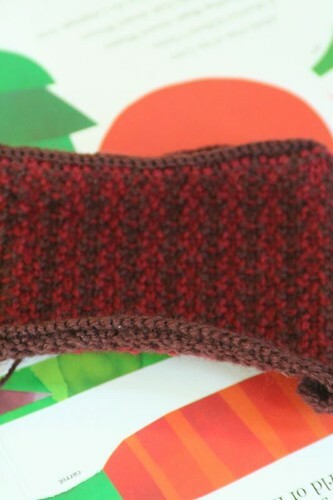 The ribbing on the sleeves took more time than the entire rest of the arms so I know that as soon as I get to 38 cm, this project will fly off the needles. Until then, I will slog along. While I complain that this is a slow, slow knit, I’ve actually made amazing time on it since I knit the entire Thanksgiving break. I started this 8 days ago and the body 6 days ago. 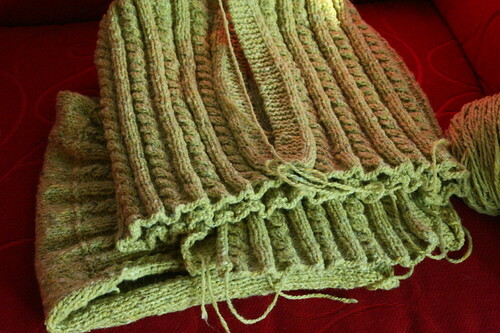 Perhaps I’ll have a finished sweater over the weekend. I took a break Monday to swatch Bryant’s Slipover Vest in Brown Sheep Nature Spun Sport as a possible knit for my cousin Ida. 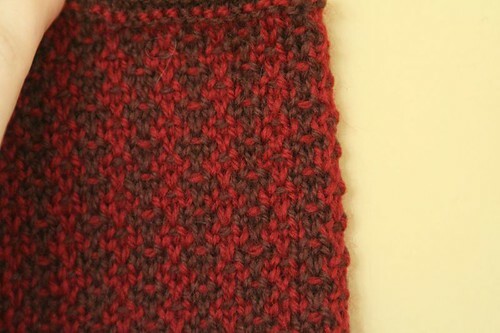 The stitch pattern looks different at different distances. I put it in the mail this morning to get her opinion. More on that project in the coming weeks. You have made incredible progress on that sweater! It looks great. Keep going! You can do it! They talk about being stranded on sleeve islanded, but torso island is much worse. Wow, that IS fast! And such a pretty pattern. Isn’t it funny how we try to psyche ourselves out? How do you take such beautiful photos? Just gorgeous. Can’t wait to see the sweater. I’m sure it seem slow when you’re working on it, but given the little needles AND cables I think you’re making incredible time. I love how it looks in that tweedy yarn. Wow such fast progress on the cabled goodness. It is looking so good. I like the vest too, very elegant. Just seeing all the progress on the size 3 needles makes my hands feel tired and twitchy! You are a knitting rockstar E! It would take me a year to do that much – and it’s gorgeous. Love the color, can’t wait to see the finished product!! Wow, all that progress on size 3s? Nice! I absolutely love the way that yarn looks in the pattern, too. The color is fantastic. Just chiming in to cheer you on! 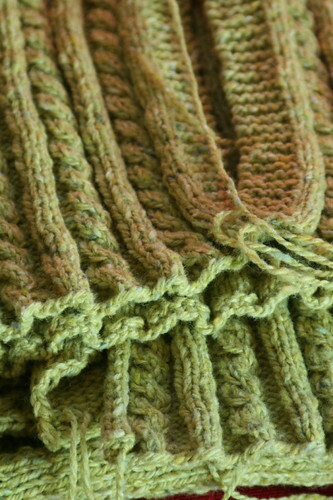 The cardigan is going to be gorgeous, and I can’t wait to see more of the vest!! LOVELY! I love small gauge. The result will be so elegant and durable. Holy heck! A sweater on US #3s? It’s gorgeous. That Drops cardi has been in my queue for ages. I can’t wait to see it on you! Such a lovely fabric with the tweed. THAT is going to be a beautiful cardigan! 8 days ago?? Now I really feel like a turtle! Oooh, I can’t wait to see your slipover vest progress! I’m definitely intrigued by it. Are you going to finish the cardi in a matter of a couple of weeks? Knit like the wind! I’m impressed at your speed, on size 3’s no less!!!?? It may seem slow, but I does sound like you’re flying on that sweater!